The vertical architecture of Bogota’s Central Cemetery and the verticality of the city outside its boundaries, behave in a similar way. The cemetery reproduces Bogota’s processes of accumulation and decay: death, hosted inside this graveyard’s mausoleums, acts as a mirror to life. Considering the city in resonance with the cemetery, and the living (outside) in resonance with the dead (inside), I made a diagnosis of the physical state of the cemetery’s buildings. For this effect, I reproduced the surface of its oldest edification, grave by grave, through full-sized frottage drawings of every gravestone. 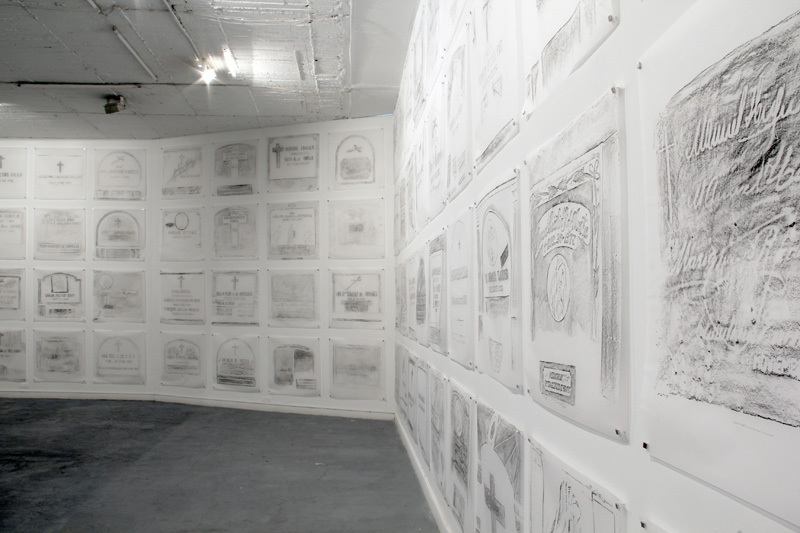 Laid side by side, the drawings form a replica of the cemetery: they are a document of this places’ presence, its scale, and the fragile state of its markers. When displayed in an exhibition space, this project also enables the intrusion of a space for death (outside) into a space for life (inside).